Features an all welded construction, concealed mounting and a refill gauge in a beautiful satin stainless steel finish. 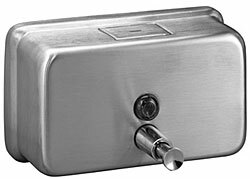 Holds 40 ounces of liquid soap and dispenses a measured amount with each use. ADA compliant.